Tucked away in the new Tyler building, the Artist’s Palate offers a different location and a different menu from other campus spots. Most students have noticed the new Tyler Art School building on the corner of 12th and Norris streets. But what most aren’t aware of is the convenient café located inside. 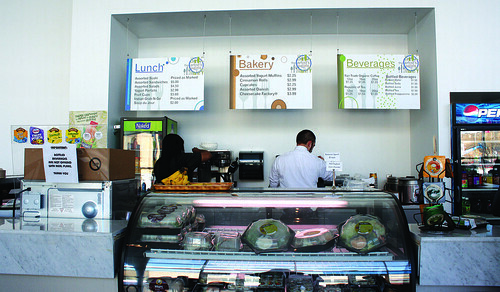 Students can purchase fair-trade coffee, salads and sandwiches, among other foods. Most of the food is provded by Sodexo (Ashley Myers/TTN). The Artist’s Palate, located near the building’s entranceway, is open to all Temple students Monday through Friday from 8 a.m. to 6 p.m. The Artist’s Palate occupies a large space. Two flat screen TVs on the walls update Tyler students on current events. Bare white walls, high tiled ceilings and large green booths provide a contemporary atmosphere for students to grab a bite between classes. “It could probably use more tables, the seating does not fit the space,” Tal Noznisky said. His friendships with Tyler students helped him find the café. Some Tyler students, like Jamie Straw, choose not to eat at the Artist’s Palate. “I hear it is real expensive – too expensive – and not very good,” Straw said. Sodexo supplies food and, like the Johnson and Hardwick cafeteria, the Artist’s Palate has its own baker. Jeff Stumpf, a Sodexo employee, said the Artist’s Palate offers treats more “artistically inclined” students might like. Republic of Tea exotic flavors include ginger peach and blackberry sage. The average price for a lunch item can range from $2.99 for a fruit and yogurt parfait to about $5, with tax, for a sandwich or chicken Caesar salad. Sushi plates are priced akin to those sold in the Student Center. Grab-N-Go Indian dishes, like the Palak Platter, can also be purchased. Prices for fresh-baked goods range from $2.25 to $3, including cinnamon rolls, chocolate chocolate chip muffins and assorted danishes that can be warmed up for free. Kali Wyrosdic can be reached at kali.wyrosdic@temple.edu. Keith Morrison, a painting professor, received a national award from Jamaica’s governor-general. Monk’s Belgian Café at 16th and Spruce streets truly is a beer-lover’s bar. Elisa Hamilton, a Boston-based artist, likes to create interactive experiences through dance.